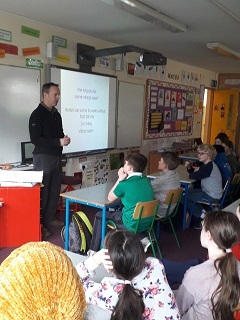 Kevin from the Inland Fisheries Ireland, in association with the ‘Something Fishy’ programme, came in today to talk to the Senior Classes about waterways, fishing, angling and the environment. The ‘Something Fishy’ education programme was a concept originally developed in collaboration between the Central Fisheries Board (CFB) and Blackrock Education Centre (BEC). We’re especially looking forward to the field trips after Easter with Kevin, when hopefully we’ll get to meet some of the stream animals we will be learning about!